In the last instalment of this discussion I concentrated on artists’ metaphorical use of trees to visually “explain” various feelings of mood experienced in landscape. For the present discussion I will shift the focus and initially address how artists have used trees to articulate, in visual terms, their vision of a spiritual presence emanating from trees; or at least, how artists have portrayed some special trees in a way that communicates a unique tree-essence that makes them noble (i.e. to “stand out” as exemplar trees worthy of respect). Later I will offer personal insights into how artists have imbued trees with human attributes and how even the smallest elements of a tree can communicate significant and complex meanings. 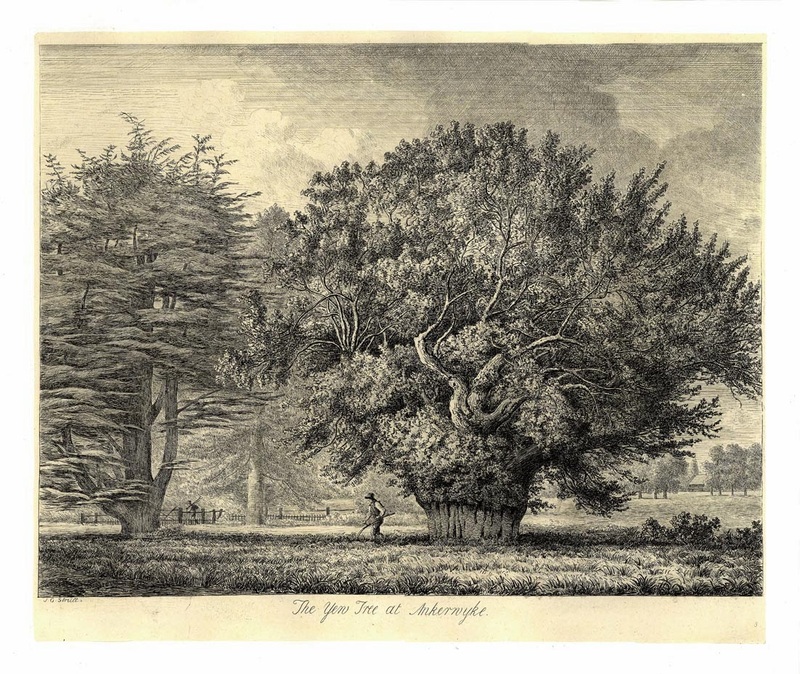 Regarding the use of trees to illustrate the idea of nobility, there is a perfect publication featuring this treatment: Jacob George Strutt’s (1784–1867) Sylva Britannica; Or, Portraits Of Forest Trees Distinguished For Their Antiquity, Magnitude, Or Beauty (1822) featuring etchings of significant/well-known trees in the English and Scottish countryside (a digital version of this book is available for viewing/downloading at https://archive.org/details/sylvabritannicao00strurich [viewed 21 March 2014]) and a copy of this book is available in this blog’s “Books” gallery [see the line of links at the top of the blog]). Loving society, yet averse from a crowd, delighting in fresh air, and in room to expand its roots, and affording its aid to all the weaker plants in its vicinity that may seek its support, it presents a pleasing emblem of the class of country gentlemen, whose abodes it is oftenest found to adorn and protect. Condition: Strong and well-inked impression with small margins. The sheet is in good condition (i.e. there is no foxing, or tears or scuffing) but the sheet is lightly irradiated and with dustiness appropriate to the age of the print (i.e. the sheet is slightly darkened). The sheet is loose (i.e. not glued to a support sheet). I am selling this print for a total cost (including shipping to anywhere in the world) of $182 AUD. Please contact me using the email link at the top of the page if you have any questions or click the “Buy Now” button below. As expressed in his insight about their propriety, Strutt’s vision of elms clearly leans more to the poetics of moral virtues rather than to biological science. Moreover, this leaning guides the way that he portrays the elm at Crawley. 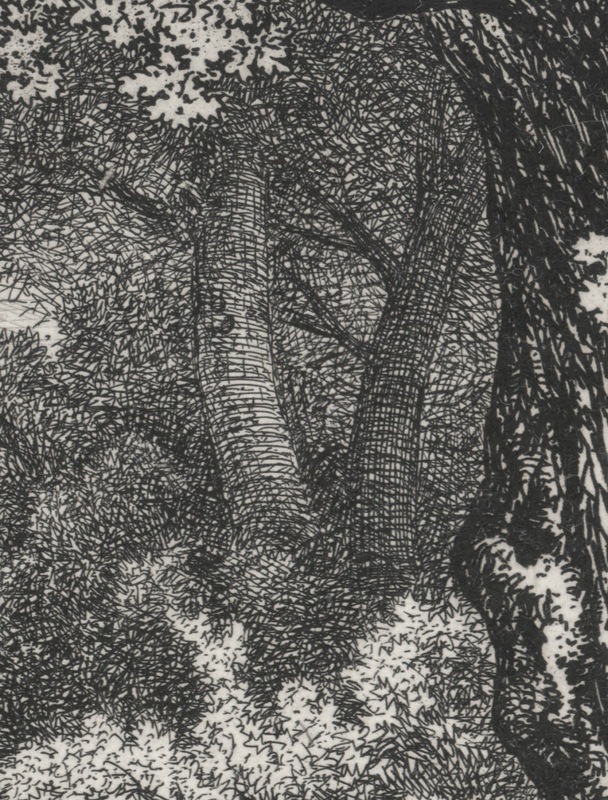 For instance, in the etching, Strutt’s chosen angle-of-view gives an eye-level, front-on, centrally aligned and unimpeded view of the tree (i.e. 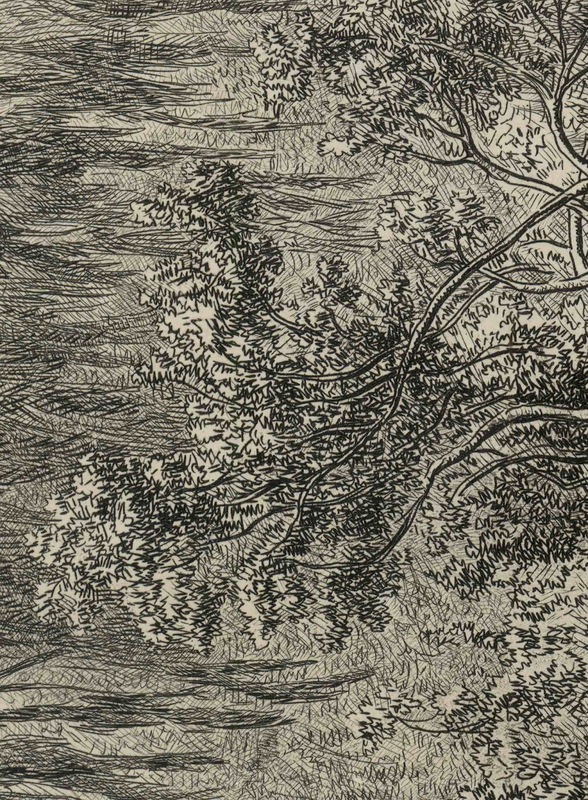 there are no obstacles obscuring a “bull’s eye” view right to the centre of the composition where the tree is depicted). 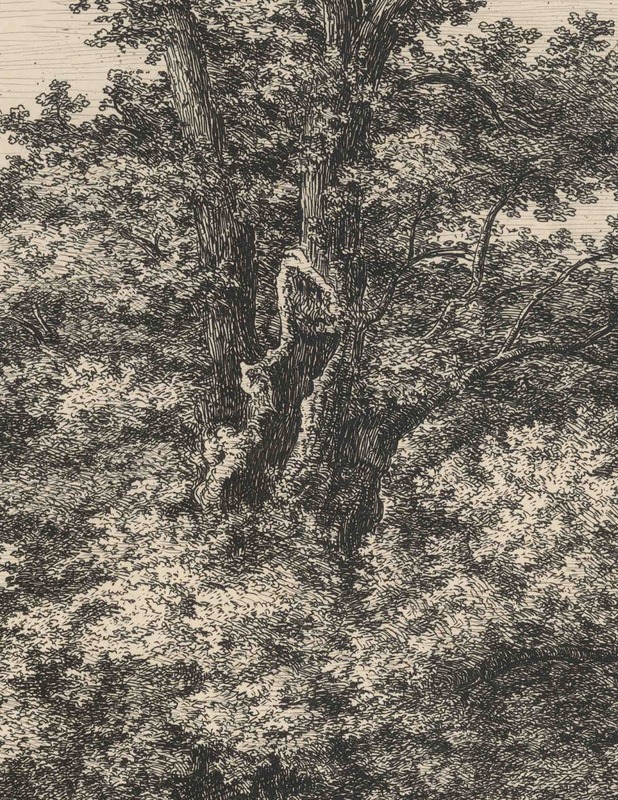 This formal compositional arrangement denotes the tree as special—in the sense that it is visually significant—while the gap of pictorial space between the viewer and the tree, casts the tree as having social status. I understand that this curious anointment of social status by a gap in space may, at first, seem far-fetched, but the size of the gap is an important visual device employed by artists for depicting people with social status. It equates with “public space”—as opposed to “intimate space”—that dignitaries leave between common folk and themselves. By extension of the same principle with the elm, the gap casts the tree with an aura of untouchable status. 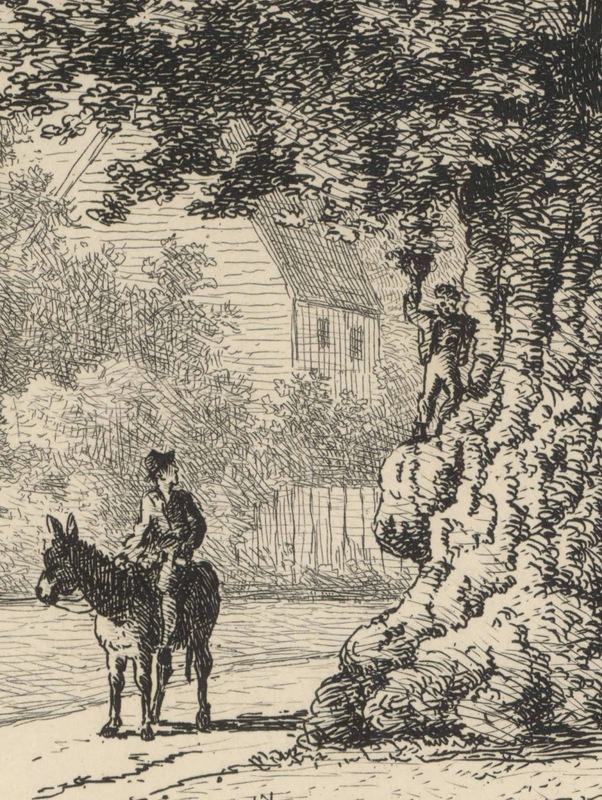 Of course, this reading may never have passed Strutt’s mind as he shows a child climbing the elm’s trunk (see detail above) suggesting that the tree is not an unassailable entity but rather a welcoming regal host. 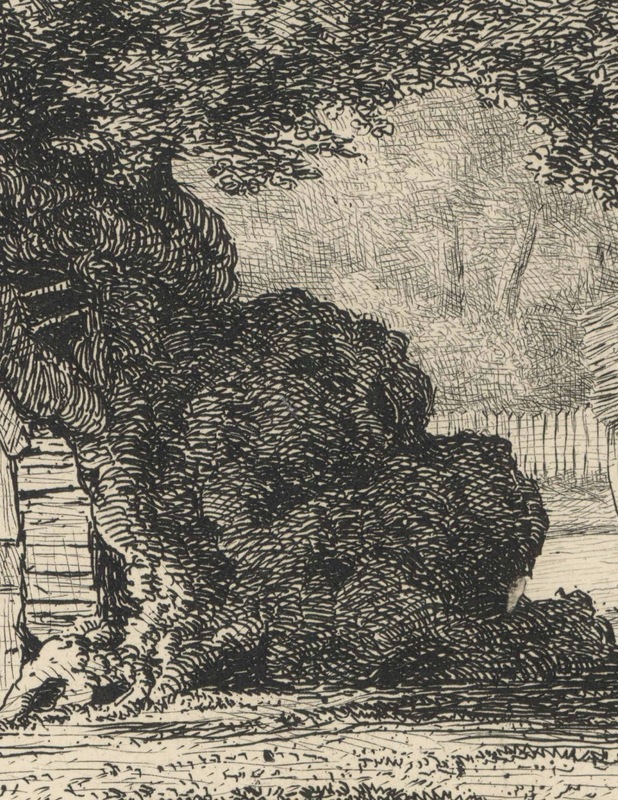 With regard to Strutt’s vision of presenting this tree as “a pleasing emblem” of country gentry, the portrayed door sealing the entrance to a homely abode within the tree’s trunk is difficult to overlook. 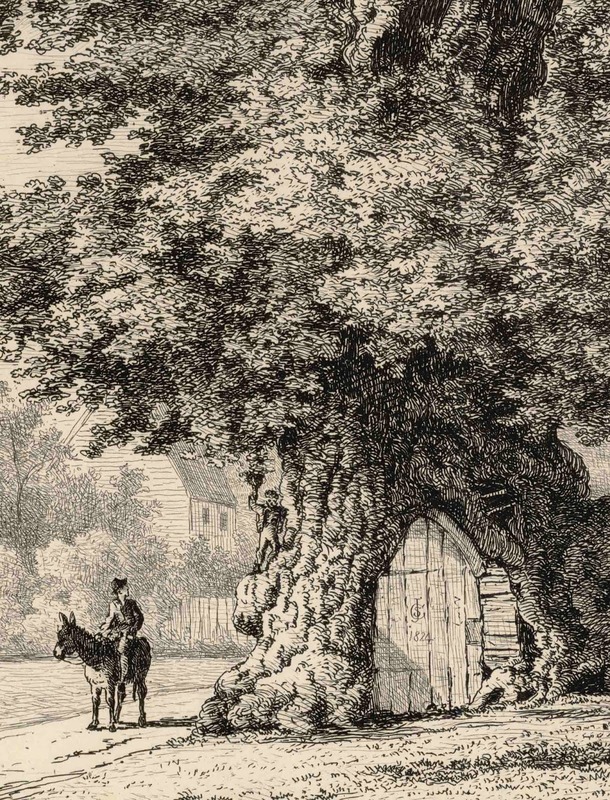 After all, the idea that there is a space within the trunk framed by an entrance door must have been a fascinating attraction for the local folk. This feature alone sets it apart from other trees, but the fact that the door is closed also projects a hint of exclusivity in that access to this tree’s heart is removed from common folk. 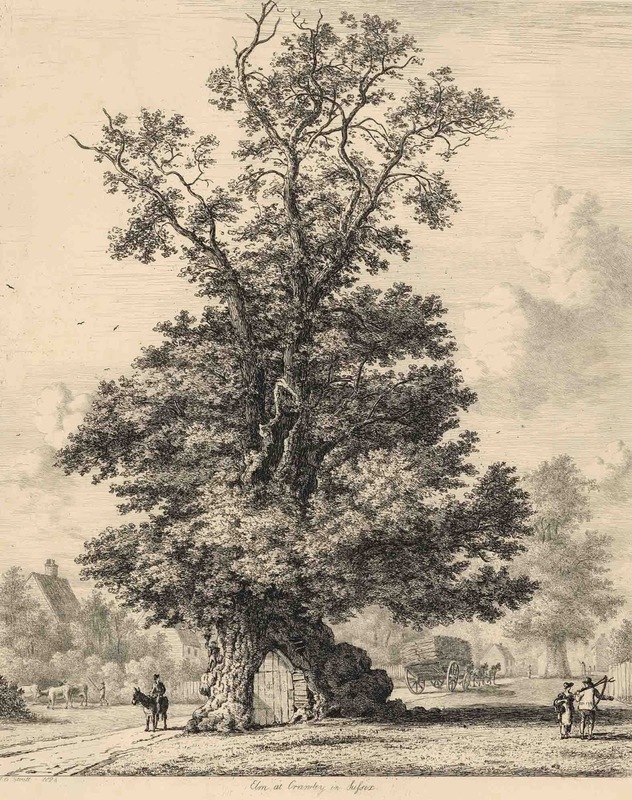 As may be appropriate for tree of magisterial stature, Strutt not only draws the viewer’s attention to the elm’s height through a comparison of its size with other features surrounding it—especially the diminutive size of the figures and the hay-cart shown in the details below—but also his treatment of the tree itself connotes a commanding presence. 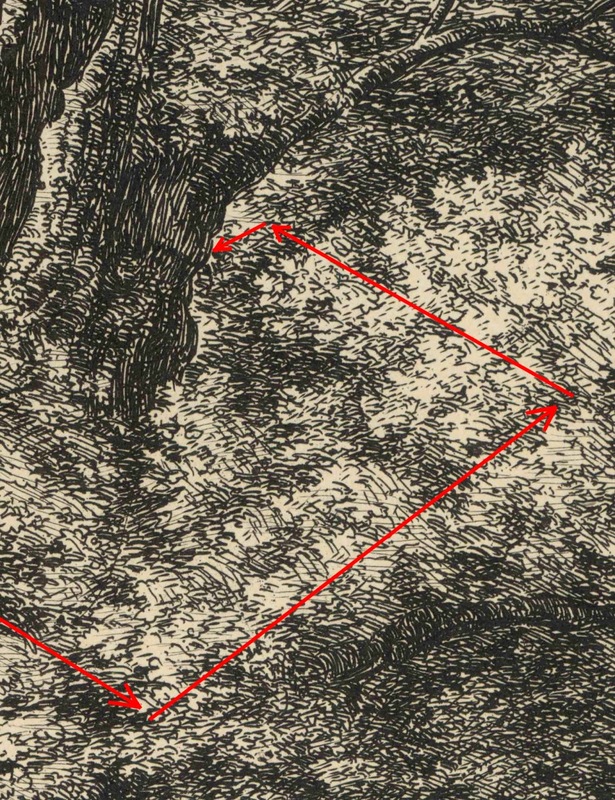 Note, for example, in the detail below how Strutt has aligned the marks representing the tree’s foliage so the each stroke helps to lead the eye in spiralling rhythms around the trunk, as if the trunk were a magnetic core holding the space encircling it in check. 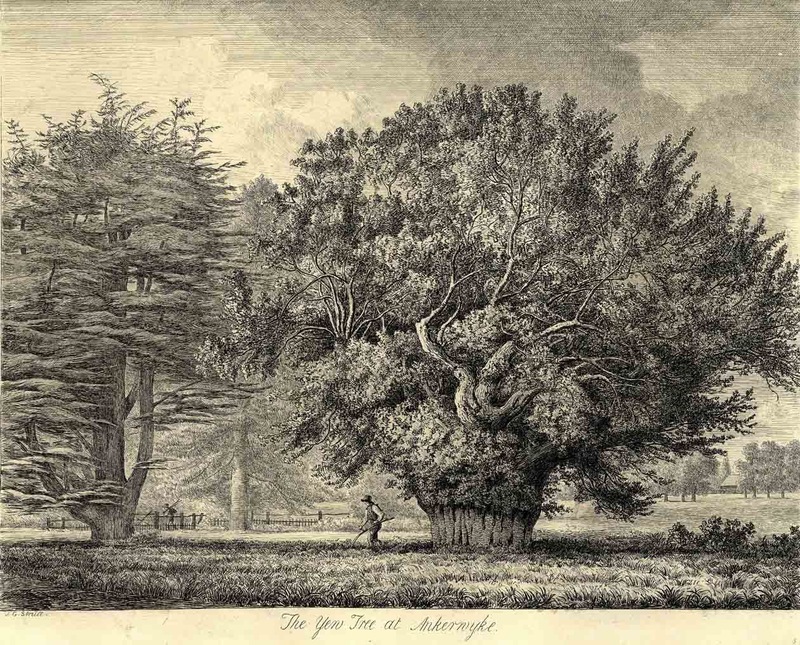 The Yew Tree—Ankerwyke, Middlesex (shown below) is another of Strutt’s etchings from Sylva Britannica. Here, the idea of rhythms connoting an aura of presence is taken a stage further. 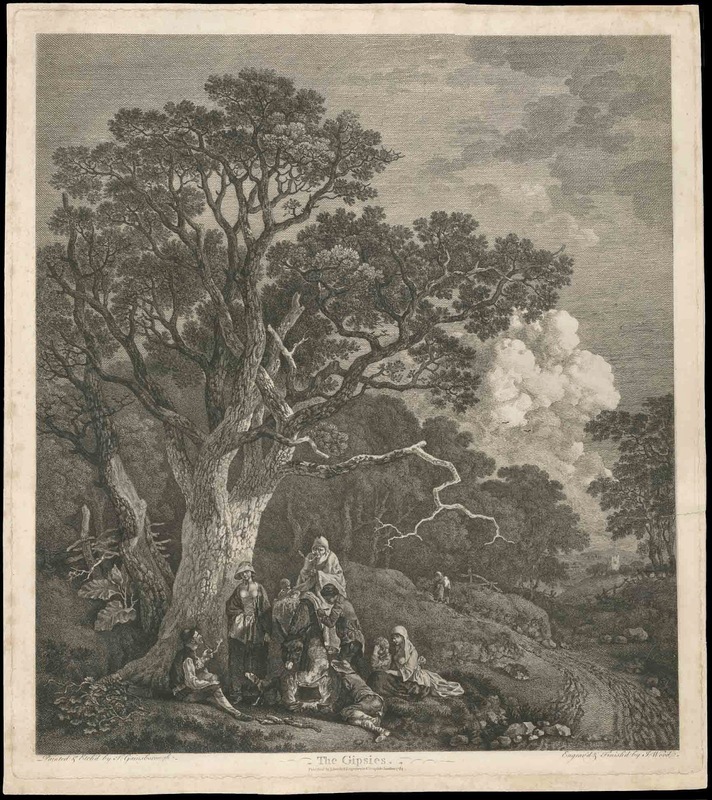 In this print Strutt portrays the yew tree as if it were an explosion in the landscape. 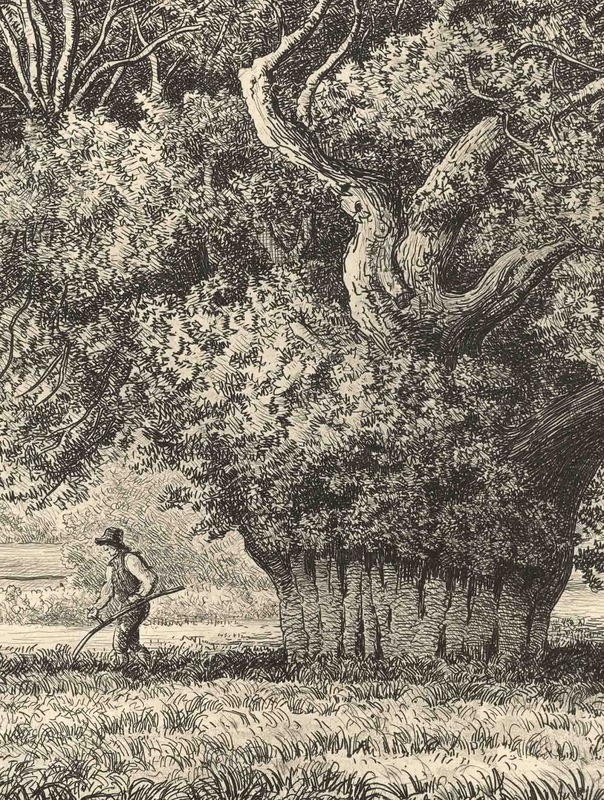 Moreover, he uses the contrast of field workers peacefully engaged in their rural tasks set against the upward lines of the trunk and the outward twisting lines of branches. For me, this contrast conveys a sense of the tree’s dynamic energy within the calm of its surroundings. Condition: Crisp and well-inked impression with small margins. The sheet is loose (i.e. not glued to a support sheet) and is in very good condition with minimal signs of handling. I am selling this print for a total cost (including shipping to anywhere in the world) of $180 AUD. Please contact me using the email link at the top of the page if you have any questions or click the “Buy Now” button below. 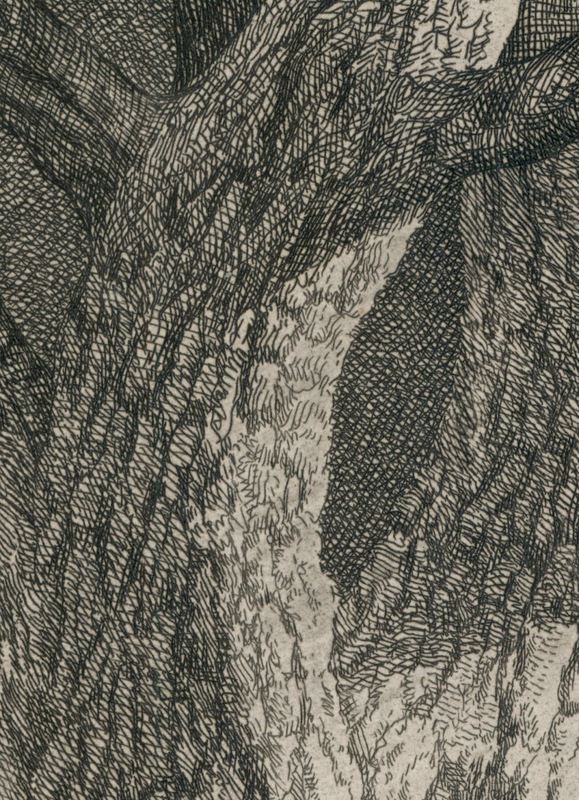 Also from a personal standpoint, the explosive presence of Strutt’s yew tree is sustained by the shapes of the two trees shown to the left side of it. 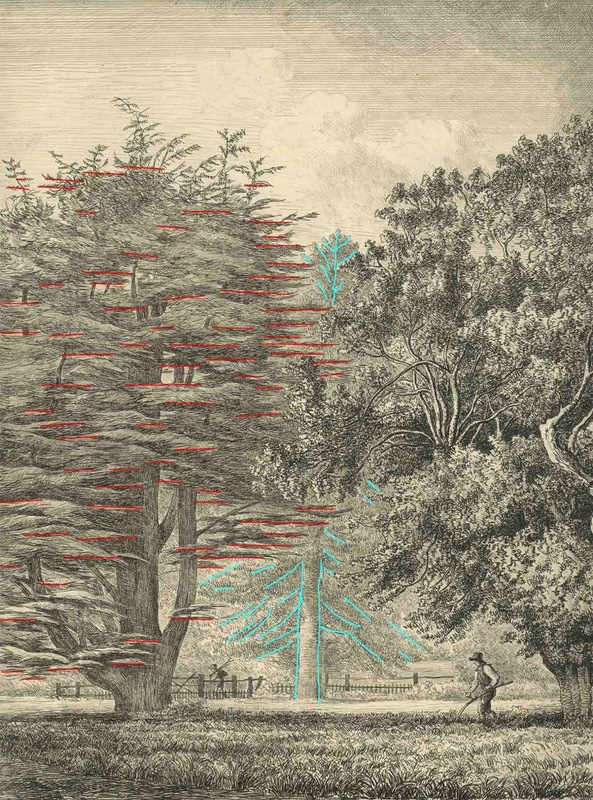 By this I mean that the structure of the horizontally layered foliage of the tree on the far-left supports the idea of lateral forces emanating from the yew, while the tree in the distance is like an arrow-head drawing attention to the explosive arrangement of the yew’s upward projecting rhythms (see diagram below). 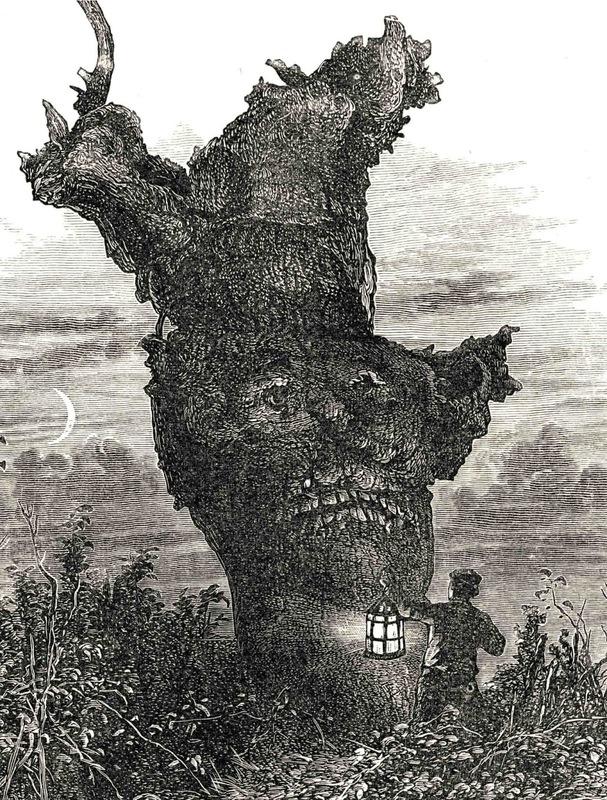 Let me now move to how artists have imbued trees with human features and attributes to communicate metaphorical meanings. In terms of unambiguous use of trees morphed with human anatomy, some artists have been very explicit. 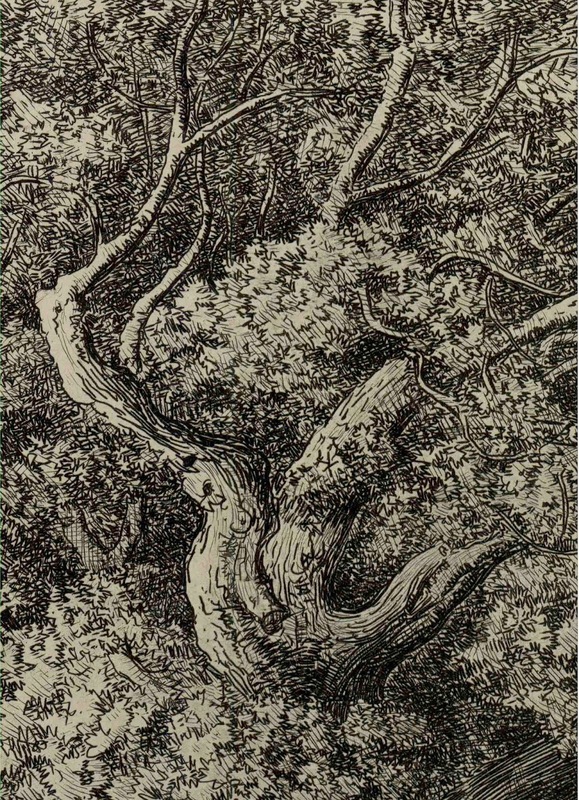 For example, Arthur Rackham’s (1867–1939) beautiful illustrations often feature anthropomorphised trees, such as The Hawthorne Tree (1922) and Suddenly the branches twined round her and turned into two arms (1917) (both of these ink and watercolour illustrations may be seen in the post, Paper Trees [24 March 2011] from the blog Mud 'n Art: https://stevemessam.wordpress.com/2011/03/24/paper-trees/) and The Monkey Tree (shown below) by W.H.J. 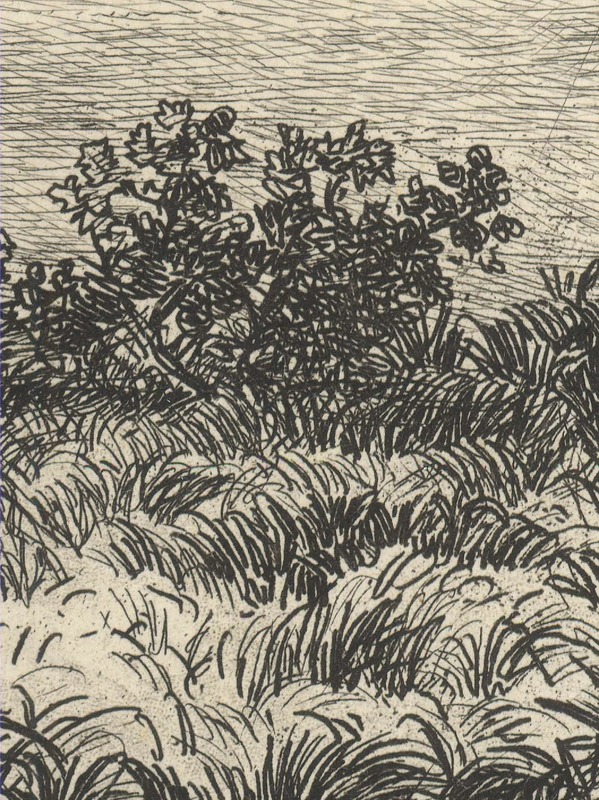 Boot (1848–1918) who also wrote the book, Trees, and how to paint them in water-colours (1883) (this book may be viewed at: https://archive.org/stream/treesandhowtopa00bootgoog#page/n4/mode/2up [viewed 28 March 2104]). Perhaps the most memorable visualisation of trees as people is the famous scene from Peter Jackson’s Lord of the Rings: The Two Towers (2002) featuring the character, Treebeard, and middle-earth forest folk, the Ents (my apologies to J.R.R. Tolkien if my description of his characters is imprecise) as shown in the clip below. From Picturesque Europe: The British Isles: With Illustrations on Steel and Wood by the Most Eminent Artists. Cassell & Company Ltd., London, p. 148. Regarding artists’ use of anthropomorphised trees, I was given a very interesting insight during a chat this afternoon with my gardener—an affectionate name for John who is married to Isabelle who I affectionately call “my cook” mentioned in an earlier post. 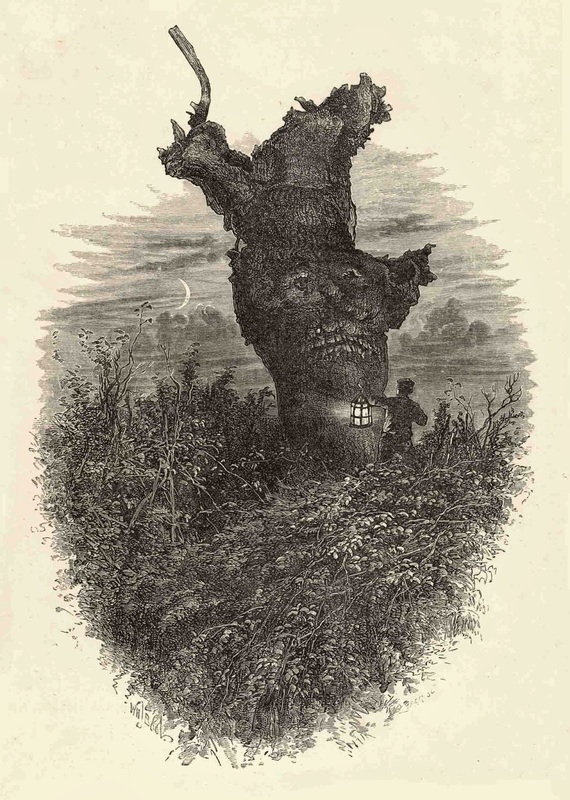 What the gardener revealed to me is that artists avoid showing the tops of trees when they are morphed into tree-people, as tops of trees don’t carry expressive meaning and they make the tree too large for practical purposes. This comment arose from his disappointment on first seeing the Ents in the clip shown above as his vision of them, based on reading the book, is that they should have leafy tops like all the other trees in the forest. 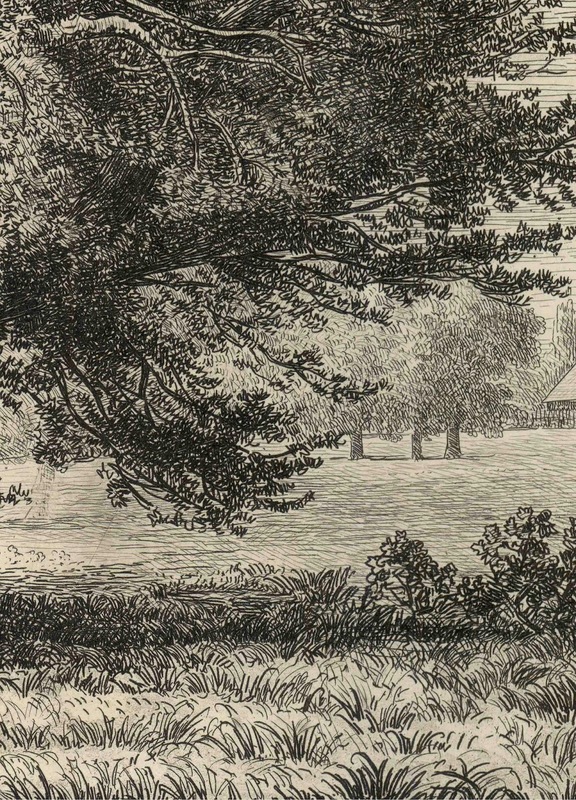 I suspect that the gardener may be correct, but, as shown by Strutt’s portraits of trees, metaphorical meanings may be projected even with leafy topped trees. 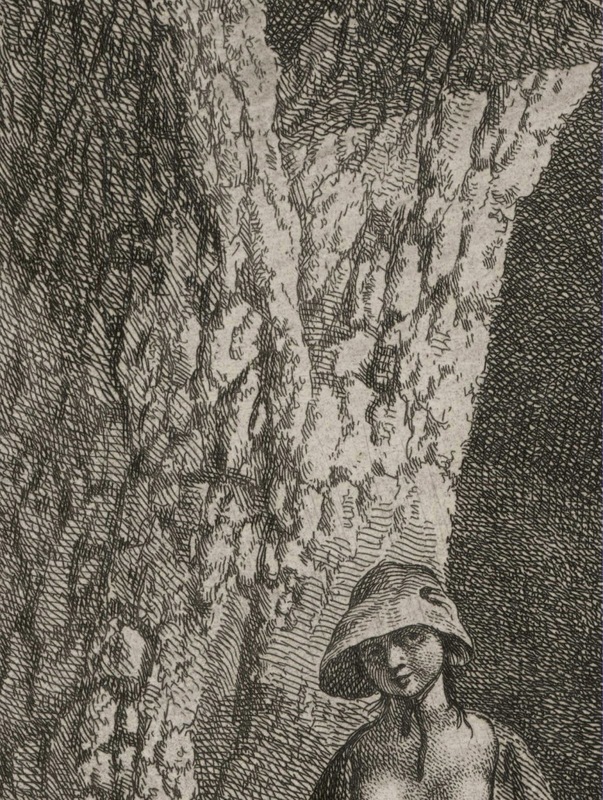 One print that illustrates how important the top of a tree can be is Eugène Bléry’s (1805–87) large etching, Le Vieux Chêne à la Figure Assise (shown below). Condition: Strong, well-inked impression with margins. The sheet has minimal signs of handling, but there is light foxing that appears to have been treated/cleaned as the foxing is pale and almost negligible. The chine collé also appears to have been removed in the past and reattached to the support sheet as the bottom corner which must have been printed with a crease has now been flattened perfectly and there also seems to be some abrasions/tears in the sky (but I could be wrong about this). I am selling this print for a total cost (including shipping to anywhere in the world) of $290 AUD. Please contact me using the email link at the top of the page if you have any questions or click the “Buy Now” button below. 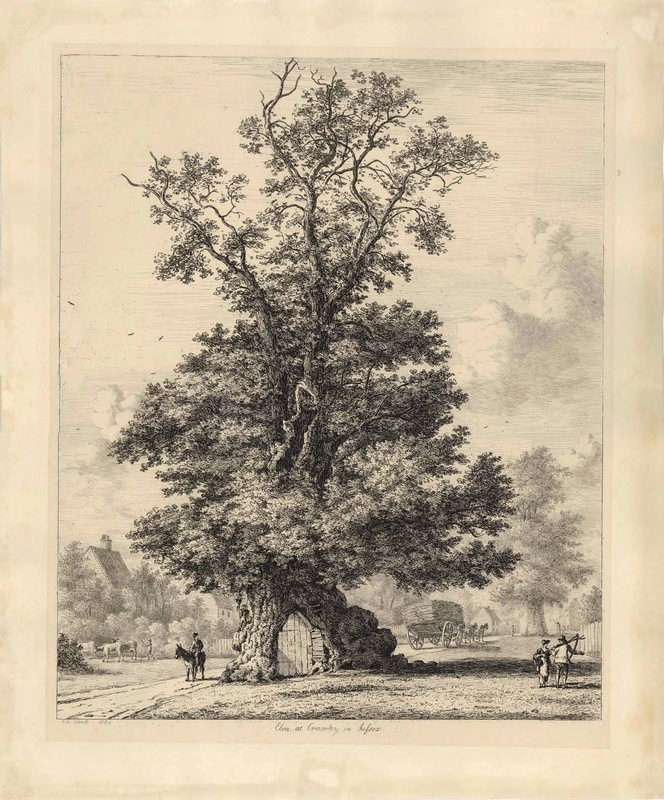 To be precise, however, the expressive potential of the large oak tree’s top portrayed in the print needs the rest of the tree and its surroundings to project a negotiable meaning. 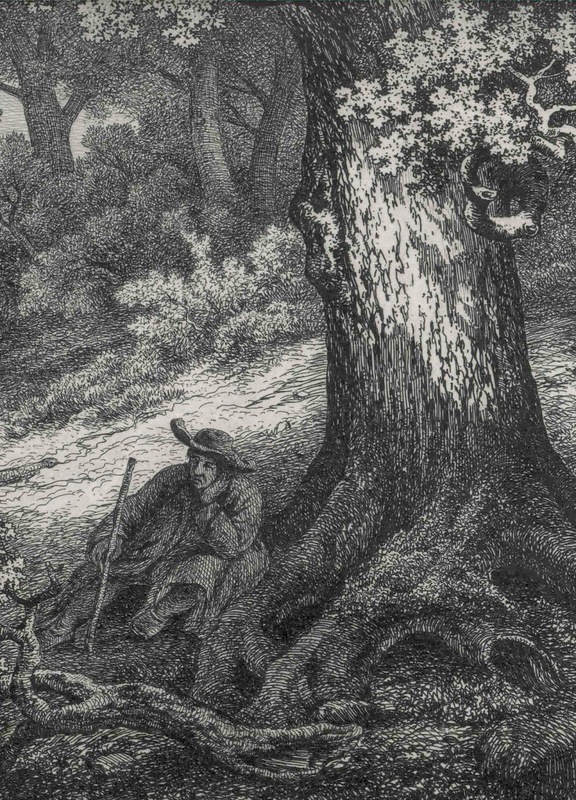 For instance, my reading of the tree and the figure resting at its base is that the relationship between them is a metaphor for a transition of mindset from temporal concerns to spiritual transcendence (i.e. 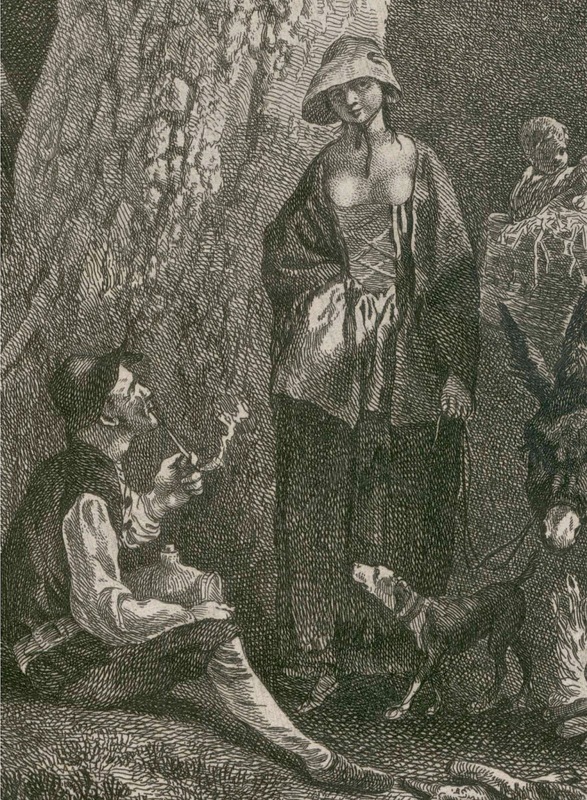 a change from thinking about everyday issues, such as herding cattle as depicted in the distance, to a state of reverie and dreamy disengagement). To arrive at such a reading is all about perceiving correlations between different parts of the composition. 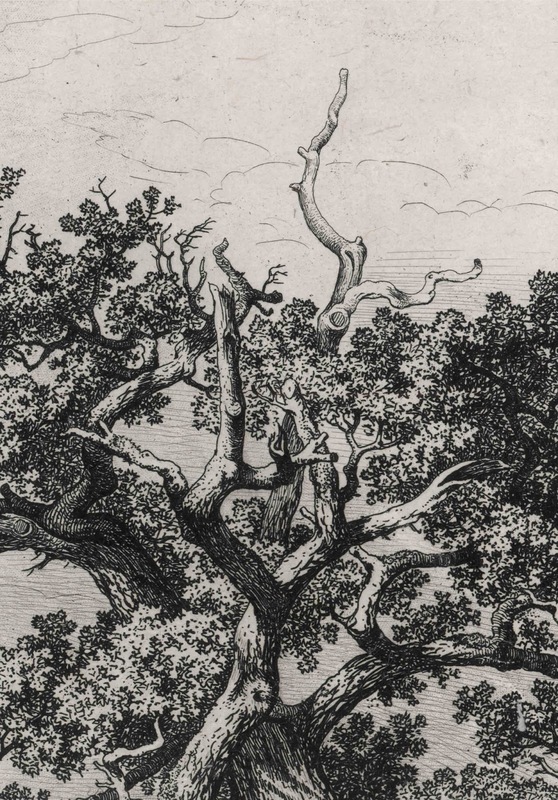 As an example of my own process of correlation, I first noticed the oak tree and then the figure resting among its roots. This initial set of observed features is not, of course, sufficient to construct the metaphor about a transition in mindset. The magical ingredient that prompted me to conceive such a meaning happened next when I noticed a figure herding cattle. 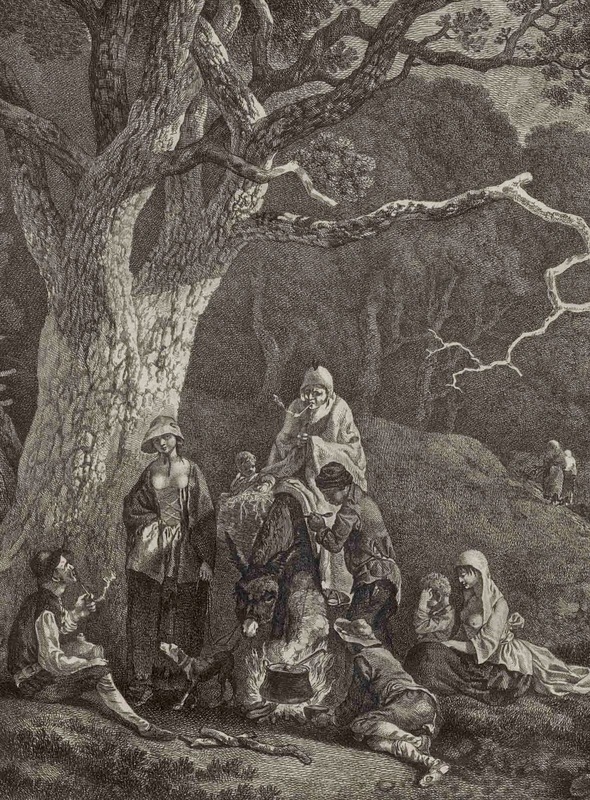 At this point my mind conceived a relationship between the two figures—the one in the distance and the figure under the tree: they are both herdsmen as they are both holding a staff and wore similar clothes. I then concocted a narrative based on the further away herdsman looking over at the resting one: the further away herdsman is displeased with the passivity of the resting one. This mini narrative may be simple conjecture but it led to the next thought: what could the resting herdsman be thinking about? And another thought: what is the further away herdsman thinking that the resting herdsman is thinking about. At this juncture of reflexive thinking, the framing of the metaphor began to materialise. The oak tree, in terms of its structure and upward spiralling rhythm of limbs culminating in the single dead branch “pointing” skywards at the top, was perceived by me as an analogue for a change in mindset rather than being simply a tree. No doubt other viewers may have different reading of this print but my intention is not to argue a case for how the image should be interpreted but rather that small details make a big difference in projecting meaning. 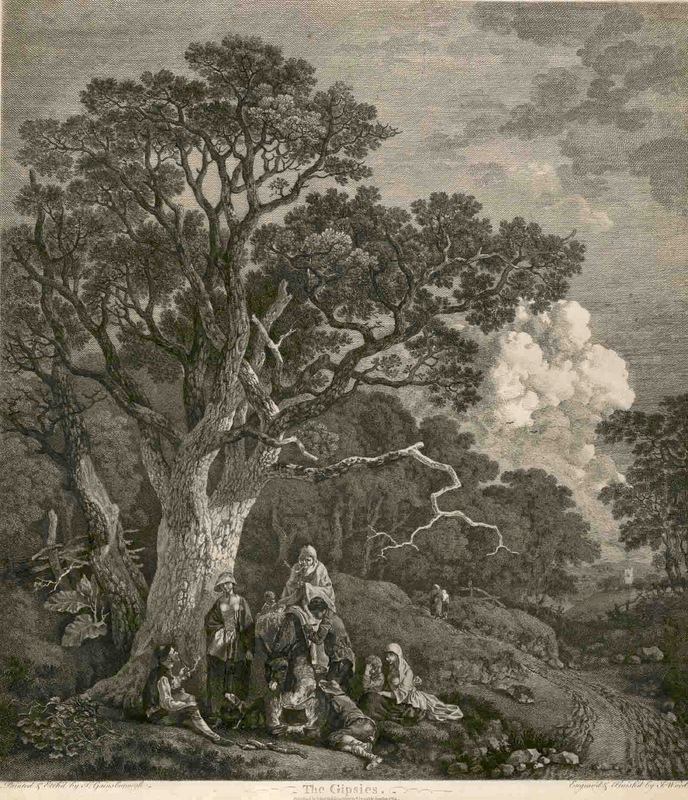 The etching records a lost picture by Gainsborough that was painted c. 1753-4 for an Ipswich patron (Waterhouse 887). An earlier and radically different version of the composition was slashed by Gainsborough in a temper and left unfinished; this was given by the artist to his friend Joshua Kirby and it is now in the Tate Gallery (Waterhouse 864; Hayes plate 33). 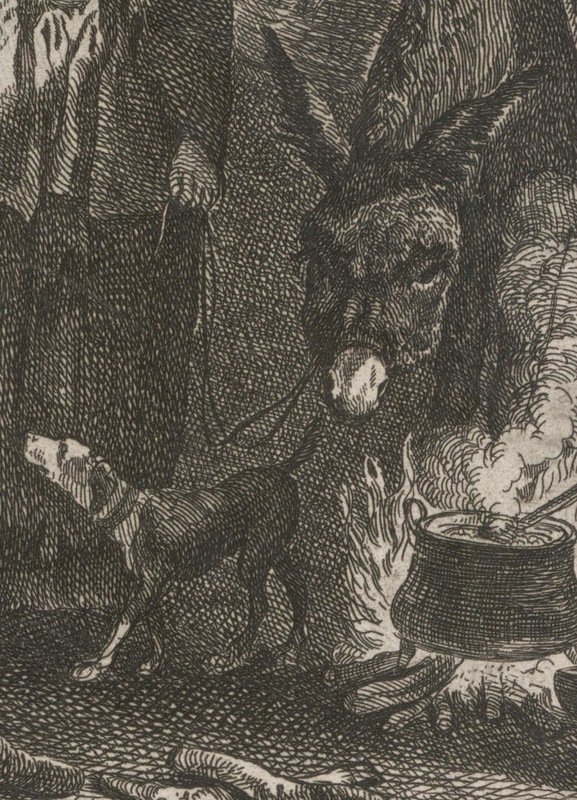 It has not previously been observed that a study for the head of the donkey is in the British Museum (Oo,2.14, Hayes 857). 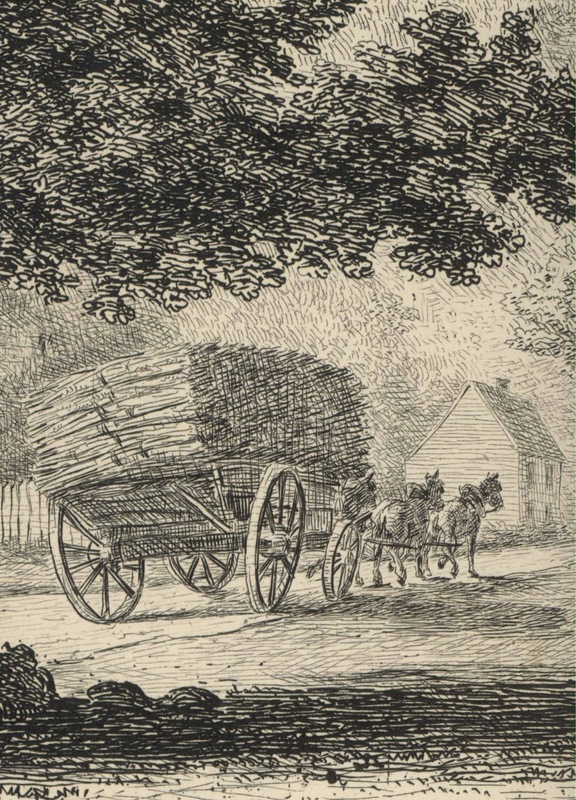 Condition: This very rare print is a well-inked impression with small margins. The sheet has light fold marks to the upper-left corner, a repaired tear to the lower right side (there is conservator tape verso) and the upper-left and lower-right corners are reinforced verso with conservator tape. The sheet is lightly aged by time and there is scattered pale foxing. I am selling this very rare print for a total cost (including shipping to anywhere in the world) of $490 AUD. Please contact me using the email link at the top of the page if you have any questions or click the “Buy Now” button below. 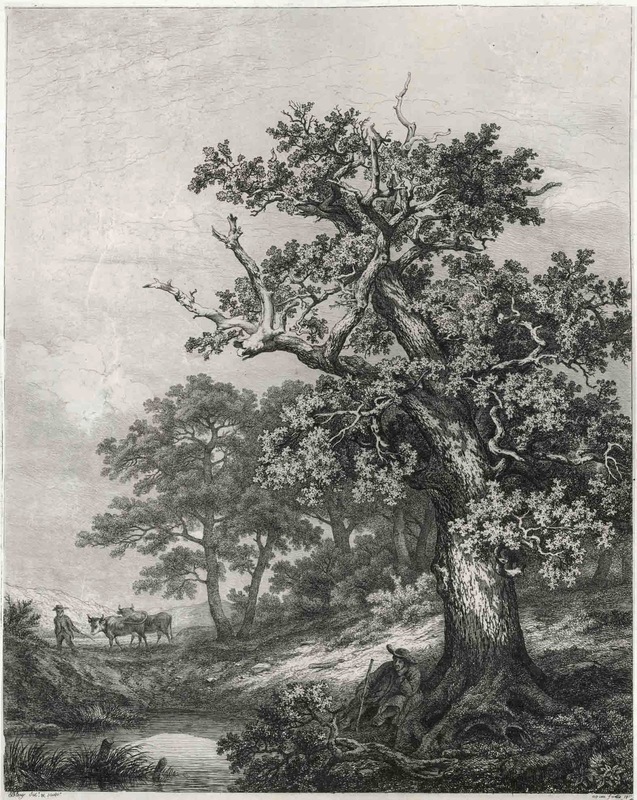 What I find fascinating about this print is Gainborough’s use of a single dead branch jutting out from an otherwise healthy oak tree to give metaphorical meaning to a group of travellers and their animals gathered beneath. 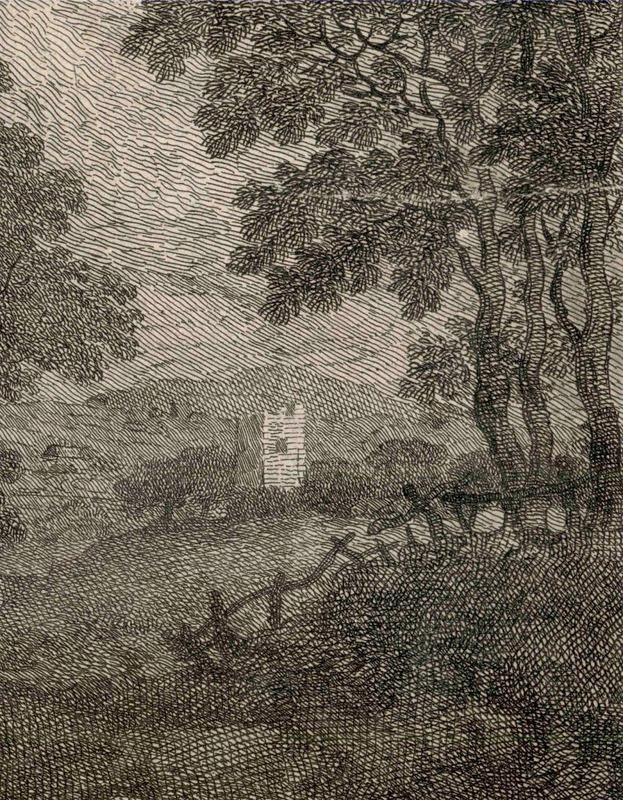 Although other viewers may see the tree and its dead limb differently, the meaning that I perceive is that the travellers are alienated from a nearby town symbolised by a stone tower depicted in the distance. This personal reading is based on correlating and constructing meaning from three critical phenomena. First, the dead branch is illuminated by the same shaft of daylight that illuminates the travellers. From my standpoint, this shared lighting pictorially links the branch with the travellers. 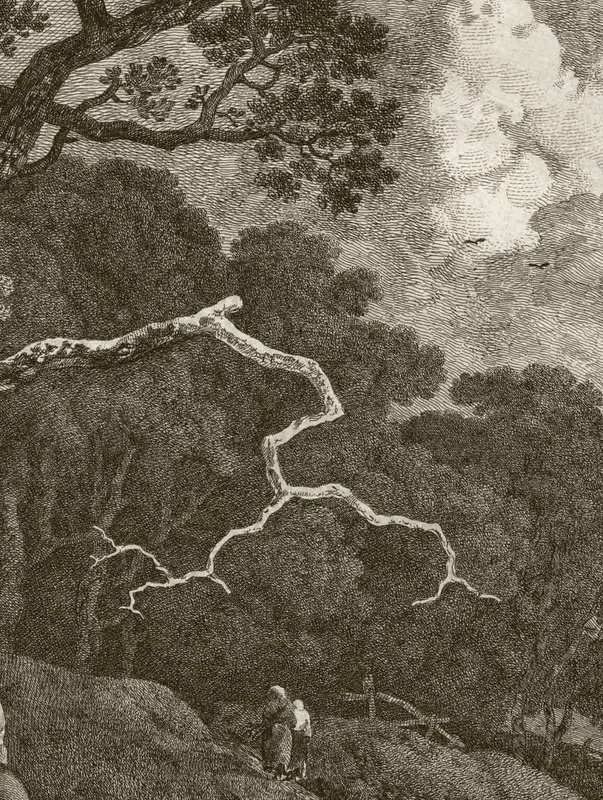 Second, the compositional placement of the branch is midway between the travellers and a far distant tower. This arrangement catches my eye and raises the subconscious query: why did Gainsborough place the limb in that position? Third, the forked end of the branch directs my eye in two different directions with one of the forked ends pointing to the travellers and the other pointing to the tower. 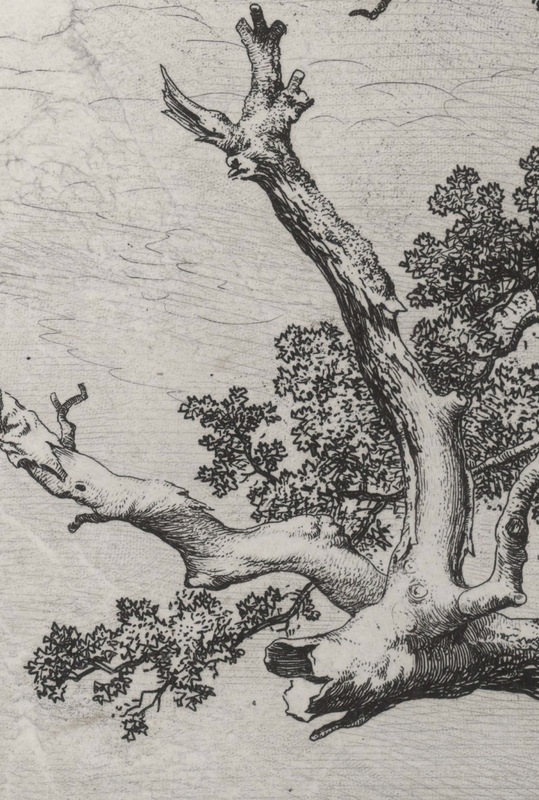 For me this forking of the branch and the direction that the two ends face suggests that there is a conceptual connection between the travellers and the tower. Going further, the angular shape of the forked limb and its pale tone set against a dark background triggers my mind to see an association with forked lightening. And, by extension of this association, that the connection between the travellers and the tower/town is not a warm and friendly relationship. 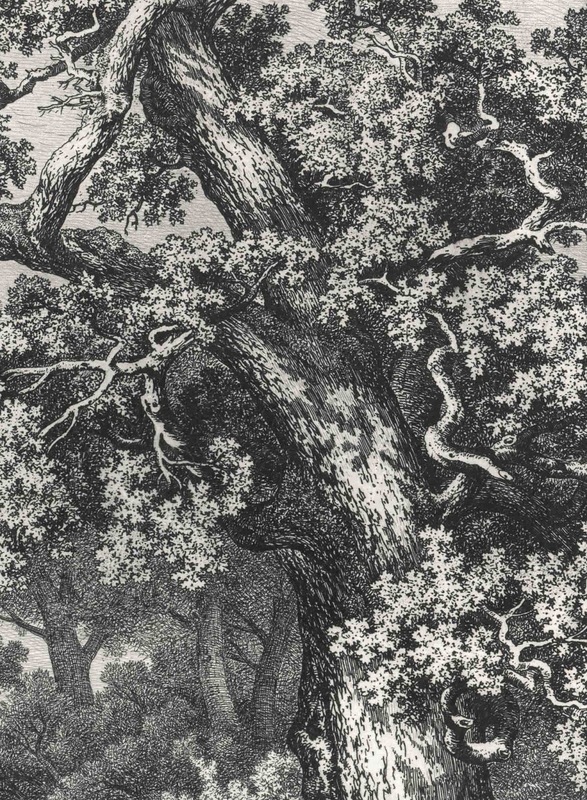 In the next and final instalment concerning trees as metaphors, I will discuss the seldom explored but fascinating world of emblem prints.